MomsRising.org | Protect Paid Sick Time in Michigan! Protect Paid Sick Time in Michigan! The MI Time to Care coalition collected nearly 400,000 signatures for a strong paid sick time initiative to be on Michigan’s November ballot because they know that when voters get a say, they support paid sick time. But here’s the twist: Rather than letting the people of Michigan vote for paid sick days on November 6th, opponents of paid sick days did a devious end run and instead passed the law themselves through the legislative process so they have the power to weaken and gut the law later this year. 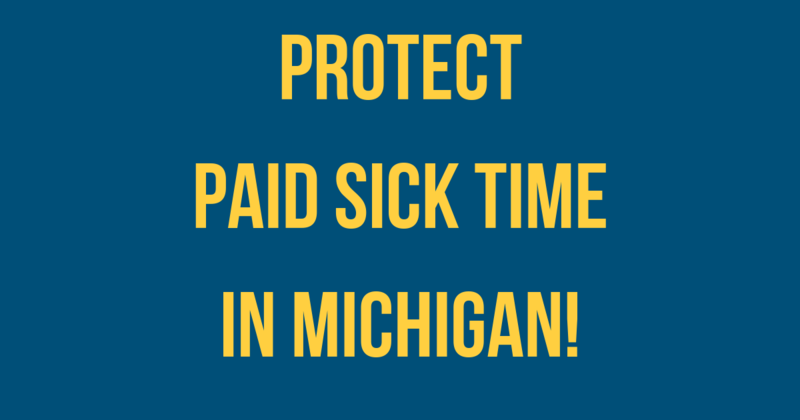 >>> Tell the Michigan Legislature: PROTECT — Don’t Gut — the new Michigan paid sick time law! I ask that you protect Michigan's new paid sick time law. Paid sick time helps working families stay afloat and helps businesses stay healthy and productive. It would be unfair and unproductive to have passed the law, only to gut it later.